Brown, A. ORCID: 0000-0003-2811-6112 and Doubleday, K., 2009. Open City: guided walk: a timed walk for a group. .
Brown, A. and Doubleday, K.
Open City is a project which intervenes in the space between the conscious and the habitual, the planned and the impromptu, the solitary and the mass. 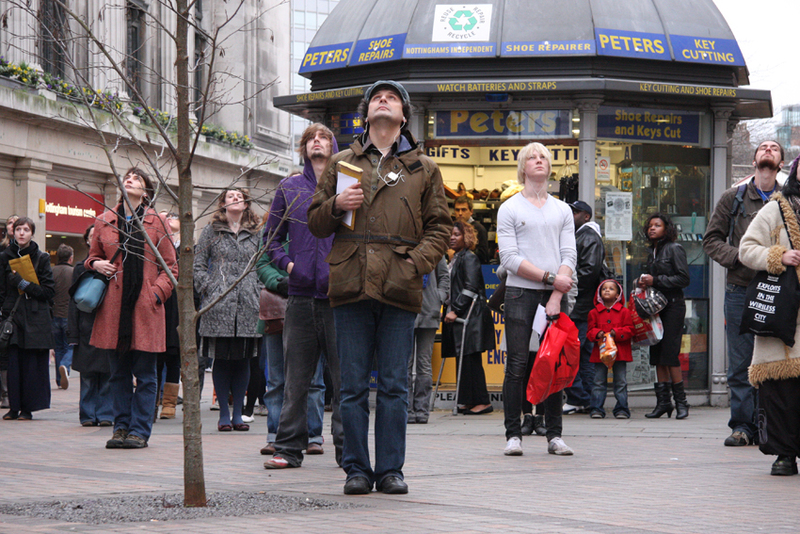 Doubleday and Brown invite the Radiator audience to readdress their position within their city and enter a space where new encounters can take place by partaking in their sonically guided walk through Nottingham City Centre. 14 photographs of the Open City guided walk. This event was part of the Radiator Festival: Exploits in the Wireless City, Nottingham, 17 January 2009.